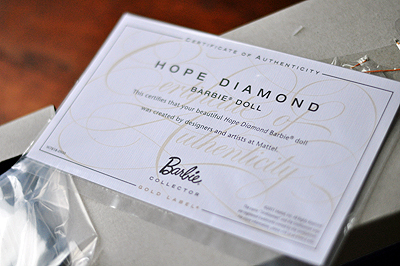 The Hope Diamond Barbie is a Gold Label collectable Barbie, created in honour of the Hope Diamond, the world's most famous diamond. This is where the Titanic connection comes in, as the Hope Diamond inspired the legendary Heart of the Ocean necklace. 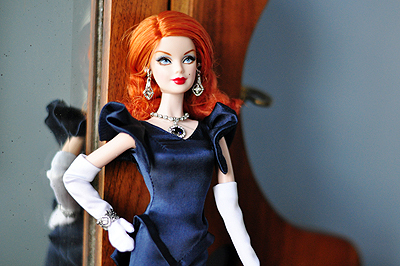 This Barbie retails for about $80. 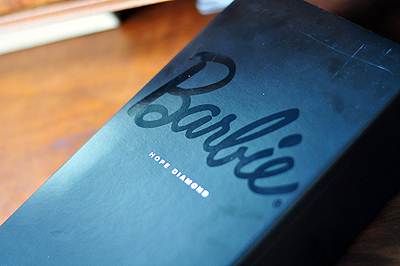 The Barbie comes in a crisp black matte box, with a fitted lid and a viewing pane. 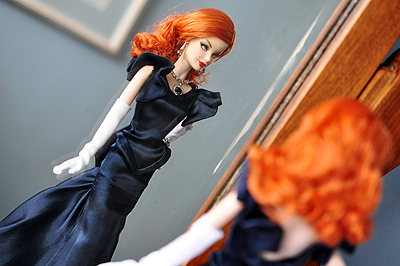 Her hair is wavy and red, and her make-up is dramatically elegant. 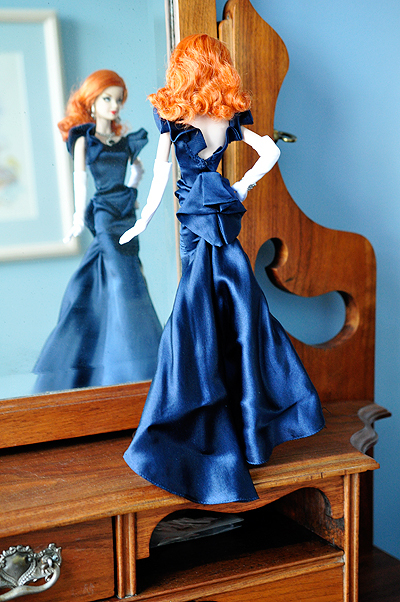 She wears a navy blue floor-length two piece dress. The dress is quite angular, channeling the angles of a finely cut gem, with a sharply flared mermaid skirt, a V-neckline, V-waist flare, and geometric pleats at the back of the bodice. For jewellery, she wears dangling earrings, a bracelet, and (of course) a Heart of the Ocean like necklace (though the gem is an oval, not a heart). 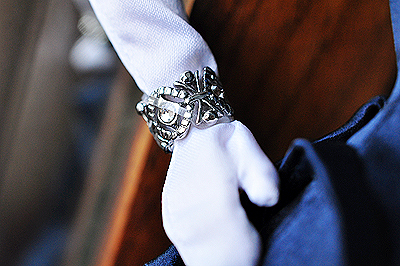 All are quite beautiful and dainty. 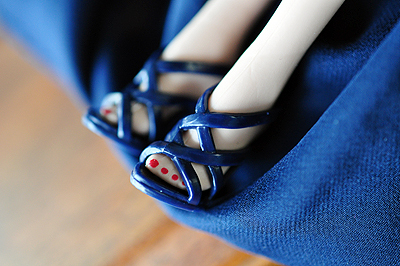 She completes the outfit with strappy blue heels and a pair of above-the-elbow white evening gloves. 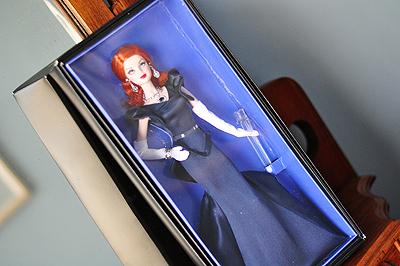 I don't collect Barbies and haven't owned one in years, but this one is quite lovely and very grown up. The matte box is luxurious, and a certificate of authenticity adds a nice touch. The Barbie is very well anchored in the box, and it took a pair of scissors and a good ten minutes to safely remove her from the box (though I suppose the idea is that you just leave her in there). 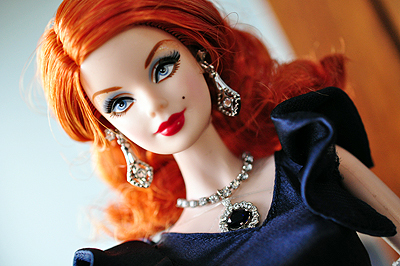 All in all, this Barbie does a beautiful job of channeling the Hope Diamond and the glamour and mystique that surrounds it. 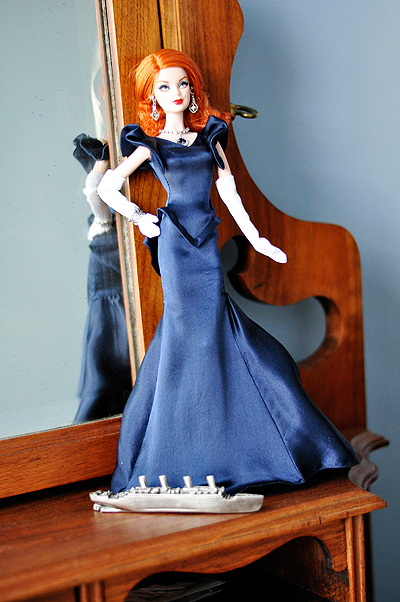 A great gift for the doll-loving Titanic fan that has everything—if you can get one, that is. 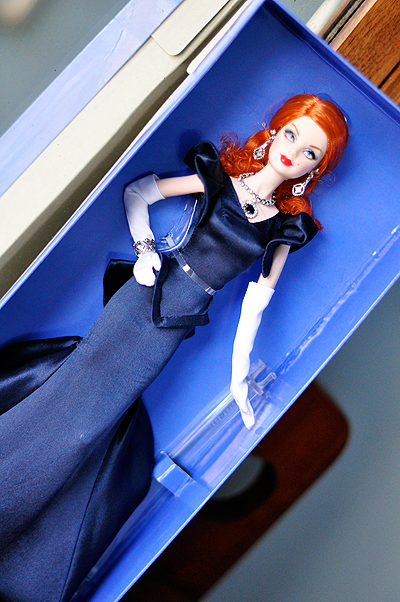 This Barbie is a 2012 limited edition, and no more than 6500 will be produced.